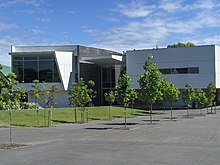 Kristin School is a private co-educational composite school located in Albany, North Shore, New Zealand. Kristin is an IB World School with approximately 1589 students. The school was established in 1973 by a small group of parents, and is owned by the Kristin School Charitable Trust (non-profit making - fees are used to pay expenses and facilities) and is governed by trustees and governors appointed from both the school and the wider community. Kristin contains a Kindergarten and is divided into three separate schools - Junior (years 0-6), Middle (years 7-10), and Senior (years 11-13). Reflecting contemporary managerialism, each school has its own principal and an executive principal has overall responsibility to the Board of Governors. At the end of 1972 St Anne's, a private school in Takapuna on Auckland's North Shore, was forced to close. Concerned parents held meetings and decided to start a new school, which opened in February 1973, using the leased Methodist Health Camp at Campbells Bay. The initial roll was 42 children with a staff of five. Fees were $100 per term. Immediately a search was carried out to find a permanent home for the future. The school grew rapidly, and soon a suitable site was found at Albany, where Kristin opened in 1978 with a roll of 235. The roll in 2007 had grown to a total of approximately 1670 with students from at least 42 cultures. Year 11 students generally complete NCEA Level 1, even if they choose to study for the IB Diploma starting in Year 12. Level 1 - Generally taken in Year 11, although English, Humanities, Mathematics and Science is offered to high-achieving Year 10 students. Kristin School has a house system consisting of four houses: Mariner, Jupiter, Apollo, Saturn. The houses are named after the corresponding space probes launched by NASA. The naming of the houses after the space probes reflects the school's and the greater Albany region's historical origins. Founded in 1973, space exploration was at the forefront of human progression and the school's houses were named to reflect the same pioneering spirit the founding parents of the school held. Many of the streets in the area reflect the importance of this era also most notably William Pickering Drive. William Pickering was a New Zealand rocket scientist that worked for NASA involved with these space probes. Other such as Constellation and Apollo Drive can be noted. Houses compete against each other in sporting codes such as Cross Country and Athletics as well as Cultural events such as House Music. House Music had its inception in 2011 and is an event where each house competes with musical theatre numbers the students have devised. House Points can also be won for academic merit and good behaviour at the discretion of the teaching staff. In the Senior School, the houses provide the framework for the pastoral care system. From Years 11-13 each house has a dean in charge of the students for each of the Houses. In Year 11 and Year 12, annual school camps are grouped by houses, and each house has its own student council to initiate community service projects within the wider school community. Since 2011, Kristin School has run a forensic science school holiday non-residential camp for gifted Year 8 and 9 students based at its campus. The participants join teams and become student 'detectives', working to solve crime scenarios using forensic techniques. Throughout the programme, students have the opportunity to hear talks from SOCO officers, other forensics professionals, and Crown prosecutors. On the final day, a trial is held for each case, where alumni judges and lawyers preside over mock cases. Student 'controller' and 'logistics' steering teams are responsible for organising the majority of the behind the scenes aspect of the camp, such as writing the crime scenarios or organising the logistics and catering behind the camp's operation, respectively. Many 'detectives' progress to becoming members of these steering teams in subsequent years. Since the camp's inception in 2011, it has grown from a 3-day event to a 5-day programme, so far held in October 2012 and July 2013, 2014 and 2015. Currently, each camp attracts upwards of 100 student participants from schools around the Auckland region. The camp has also expanded to include a 5-day "Senior Scholars" Camp for students in years 11-13, and a "Junior Edition" day camp for primary school students. Teachers-in-charge of the project pride its student-run and student-led approach to organisation, planning and operation. Originally named the "Canteen Fashion Show", the event was started by Claire Ashenden and Tom McRae in 1998 after a close friend and classmate died as a result of cancer. The students thought that a positive way to help other teens in this situation would be to raise money. They decided to this by hosting a fashion show, and passing all proceeds onto CanTeen, a New Zealand organisation who works to provide support for teenagers with cancer. Eight years on, the name has been changed to "Kristin Fashion Show" (as proceeds are now divided between The Child Cancer Foundation and CanTeen). This event features some of New Zealand's top clothing labels, which are all modelled by Kristin students, who range in age from 5 to 18. Raffles and auctions are held during the show, again with all proceeds going to CanTeen and the Child Cancer Foundation. Every year the fashion show committee strives to find way to increase audience enjoyment, and the amount raised for these charities, in 2007 the show raised $30,000 NZD. Over the two nights of the show around 3,000 people will attend. The show relies entirely on sponsorship from the community, and gains no funding from Kristin School itself. The Kristin Fashion Show, after many years of running, had its finale show in June 2012. Kristin School has become part of a worldwide robotics competition known as VEX Robotics, along with many other schools on the North Shore. The entirely student organised team has been named K-Force and consists of students ranging from Year 7 to Year 13 who have put their name forward to become part of various sections of the organisation. More information about Kristin Robotics can be read on the K-Force Team Website. Euphony is Kristin's Senior School All-Girls Choir. The choir is composed of generally four vocal groups, SSAA, however it may vary between various pieces. Euphony often makes to the National Finale of "The Big Sing", winning various awards. In 2007, Euphony won a prestigious Gold award at the National Finale in Christchurch and in 2008 won a Silver award in Wellington. Euphony also won both a Gold award and the Youth Ambassadors award in 2010 at the National Finale in Auckland and stood apart from other choirs with their memorable piece "Tjak!". In 2011, the Big Sing National Finale was held in Wellington again and Euphony won a silver award. In 2012 Euphony won the inaugural award for the best recital by a female choir at the Auckland region of the Big Sing (and won this again in 2013), then went on to win a gold award at the finale in Wellington. In July 2013 Euphony represented New Zealand at the International Musical Eisteddfod in Llangollen, Wales, where the choir was placed 3rd in the open female choir category and 7th= in the senior children's choir category. In September 2013 Euphony went to the Big Sing National Finale and won a gold award. In 2014 Euphony attended the Big Sing Regionals in Auckland and won the inaugural award for the best recital by a female choir at the Auckland region of the Big Sing for the third time. This page was last edited on 4 February 2019, at 15:59 (UTC).